Only those suffering from this condition can truly describe the agony of having a toe nail growing in the wrong direction. Nails tend to grow inwards into the skin usually due to excessive trimming by an overenthusiastic pedicurist, wearing tight shoes, as a result of injury as well as sometimes due to a hereditary tendency to such ingrowths. Once a nail embeds itself into the surrounding skin fold inflammation leading to pain and infection sets in. 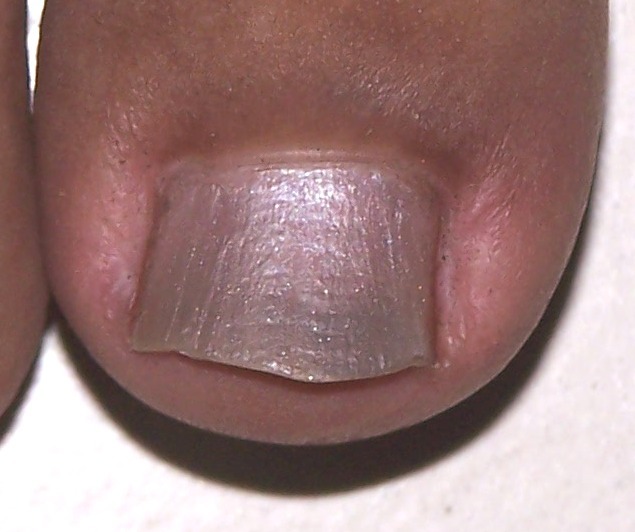 Though the great toe is commonly affected, other nails may also get affected. Individuals with the great toe affected tend to wear open or broad front shoes. However, the chances of the condition worsening always exist if someone steps on your foot or due to trauma. Homeopathic medicines cannot cure an ingrown toe nail when it has already grown deep into the peripheral skin fold. However, once the ingrown nail is trimmed, the medicines can prevent the nail from growing inwards, reduce or cure the inflammation and heal the fold of skin growing over the nail. The above photos are of the great toe with an ingrown toe nail and the fold of skin growing over it. The medicines prescribed wonderfully healed the inflammation and abnormal skin growth over the nail in a matter of few months. Remedies which are capable of preventing abnormal skin growths, inflammation, and infection as well as those which support healthy nail growth are prescribed. If you or someone you know suffers from recurrent ingrown toe nails we would strongly recommend that you start homeopathy from a registered homeopath and physician. If you wish to procure the medicines which we find useful feel free to visit us or order them online. I am 70 years old and my left toe nail has already penetrated into the skin on the right side and is giving unbearable pain at times *not continuous. It is crooked in shape. While sleeping, even the blanket touches the toe end, it will give raise to enormous pain. (ii) for shedding of toe nail on its own accord (iii) for preventing its recurrent problem.